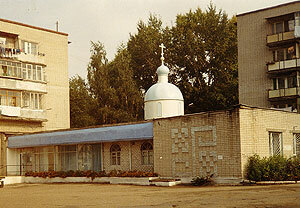 On February 24, 1997 in Derbyshki village, Kazan city indoors of the Municipal library No 17 a parish Sunday school was opened. On June 14, Memorial Saturday before Pentecost Archbishop Anastassy served the first Divine Liturgy in the former air-raid shelter, which was arranged, as a house church. There Divine services had been conducted on Sundays and on Feast days for ten more years. Three days before celebrating Easter, on April 16, 1998, on Great Thursday the first Divine Liturgy was served in the former café “Lesnoye”, where Divine services are performed and classes of the parish school are held until now. The construction of a new church for several hundred of the faithful began in 2006. Archbishop of Kazan and Tatarstan Anastassy consecrated on August 26, 2006 a null cycle of the construction. Archpriest Dimitry Bogdanov is a rector. Clergy: priest Nikolai Khusainov. Divine services are held on Sundays and on Feast days: Liturgy at 8.00, all-night Vigil at 16.00. On Friday at 8.30 Moleben (service of intercession) is served.